I love love love coconut! It adds a creamy dreamy pizzazz to all my Thai inspired dishes. There can never be enough coconut in my world! For the rice be sure to use coconut milk instead of water. It really takes it up a notch! Starting to see the coconut obsession yet?? 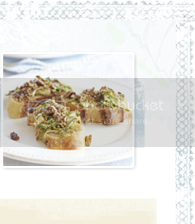 These are the kind of recipes I get really excited about--simple, but not boring! Seafood and coconut are a match made in heaven. I recently posted a similar thai coconut salmon, that received a lot of comments about the interesting combination of coconut and fish. Really, it's that good! Unlike my salmon recipe, with this recipe I added fresh chopped ginger. Don't skimp. Want to add more ginger? Go for it! There's no such thing as too much in my book. Heat olive oil in a medium skillet over medium heat. Add the minced shallot and cook until translucent, about 2-3 minutes. Add the ginger and garlic to the skillet, cooking until fragrant, 1 minute. Pour in the coconut milk and red curry paste, stirring well. Lower heat to medium-low and bring to a slow boil. Turn heat to low and simmer until slightly thickened, around 7-10 minutes. Add the lime, honey and parsley. Season with salt and pepper. Take off heat. In a separate skillet, heat remaining 1 tablespoon olive oil over medium heat. Add the shrimp cooking until pink and firm, about 2 minutes per side. 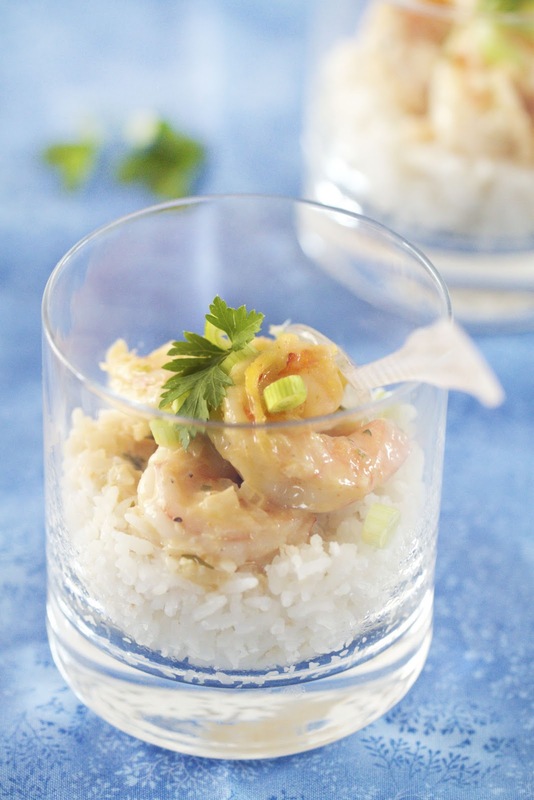 Scoop rice onto serving plates, spoon shrimp over rice. Garnish with parsley and green onions. Serve! I love adding coconut to Thai dishes. These flavors have me drooling, Katie! This shrimp looks wonderful! I'm a sucker for anything Thai, but coconut dishes are extra dreamy! So luscious. DELICIOUS. The flavor combo is great. A must try this Summer. I love all the flavors in this Katie, and what a beautiful way to present the dish. Happy weekend! This dish is STUNNING! I completely agree about coconut -- it's one of my favorite flavors to work with too, and I love the bold flavors like garlic, ginger, and curry that you've paired with it in this dish! --I feel the same way about coconut. I LOVE it...especially mixed w/ shrimp or chicken. Mmmmm. I love curries, coconut milk and shrimps so I find that dish particularly mouthwatering! ME TOO!! I love coconut - in desserts, savory dishes, anything! I especially love coconut curry and you know that I'll be making this very soon! You cooked rice with coconut milk - this is a double flavor and I'll be completely hooked with this recipe! Love shrimp and coconut, so this is a hit for me..
ehhh I think the recipe forgot to add the shrimp! Thank you! This is what happens when I write a post past my bedtime ;) I updated the recipe. The presentation is wonderful. I love how unique your pictures are! What lovely flavors! I am a bit coconut crazed myself, and this is just wonderful! That shrimp looks so succulent! Yum. Pinning, printing, saving - making soon! These sound incredible! We are kinda in the same wavelength...I made shrimps and I made Thai curry - but not together, heehee. Your recipe is making me drool. Using coconut milk for the jasmine rice is a brilliant idea indeed. Thai inspired dishes are never boring. This looks delicious! Hi Katie! I just randomly found your blog while looking some information for my own, and I am so glad that I did! Funny how things work out. I also share your passion for family and food. I love cooking food healthful food for my loved ones to enjoy. This recipe looks tasty. I just love jasmine rice cooked with coconut milk! It really makes such a difference in the texture of the rice. Yum! 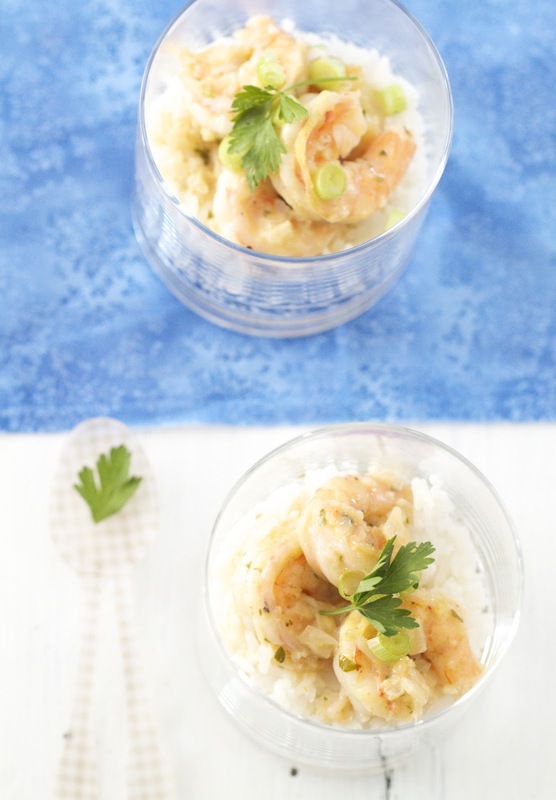 I've seen a lot of recipes with shrimp lately which is making me want to grab some! 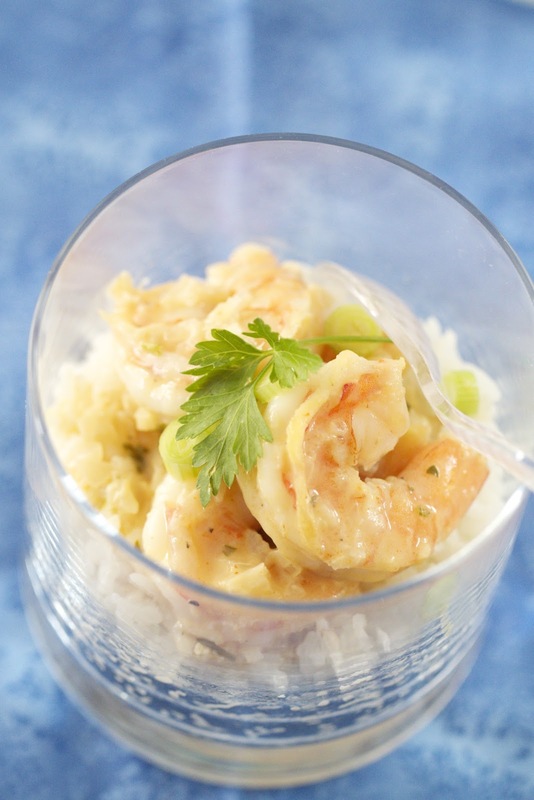 I love your combination of shrimp in a creamy Thai-inspired dish. Wow..!! The leaf of coriander is making it more delicious. This looks delicious! I will definitely try this! Thanks Katie and happy mother's day! These recipes are amazing. I really like it. It looks delicious and nutritious. What a healthy recipes. Can't wait to try this. Thanks for your great blog. What a beautiful dish served like that. 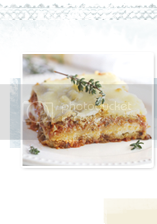 Looks very elegant and it is perfect for entertaining over the new year.